Pinnacle CEO Donates to KTAR Radiothon for PCH | The Pinnacle P.O.V. 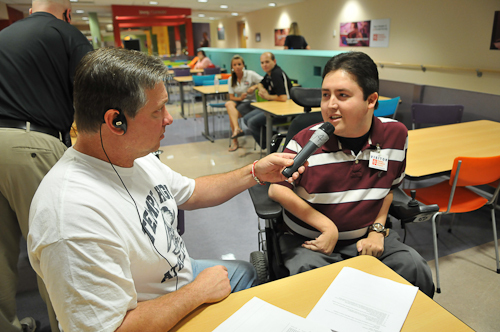 Gabe talking with Ron Wolfley at the KTAR Radiothon for PCH. Pinnacle Education CEO, Dr. Michael Matwick, donated $500 to Phoenix Children’s Hospital during this year’s KTAR Radiothon. Gabe Trujillo, a former patient at PCH and current Pinnacle employee, was on hand to help raise funds for the hospital and presented the check to KTAR’s Doug and Wolf during his on-air interview. Dr. Matwick heard Gabe’s story and decided that he wanted to do something to help this great cause. The event runs all day today, and if you want to know more about the radiothon, visit www.ktar.com. ~ by pinnaclepov2224 on September 17, 2009.